If you live in other parts of the country or the world, you may not understand the mind of a Southerner. On the other hand, there’s probably no “may” to it. Sweet tea in Mason jars. It’s a Southern thing. You don’t understand why we like sweet tea, grits, cornbread, fried okra (if it’s done correctly), banjos, guns, God, and an occasional jab at the North (those *@!% Yankees). But that’s OK, we love you, anyway, as our typical hospitality demonstrates. But when it comes to winter… You guys up north REALLY don’t get us. Seriously. Anytime we get excited about snow, you talk about how much you can’t stand it. You even make fun of how we shut down our lives when no more than a quarter of an inch falls on the streets. You really, really don’t understand. So, when yesterday morning was the coldest day of the year so far, and when this morning’s temps were all the way down in the high 20’s here in Chattanooga, you folk not from here don’t understand how a guy like me could be giddy over being able to break out a fleece-lined flannel shirt in order to go outside and see my breath as I walked over crunchy, frost-covered fallen leaves. You see, it’s like this: When you’re accustomed to frying in high heat and swimming in humidity, actually experiencing cold weather in winter is refreshing. And, yes, we are dreaming (and hoping, praying, etc.) for a white Christmas. However, there are some Southerners who hate any kind of cold. Many of them are the poor and elderly who don’t have the ability to fight off the low temperatures. They suffer during this time. But then there are others who moved to the South to escape the cold winters of the north; they feel betrayed when it gets cold down here. “Hell” is a word that is used in describing a whole host of things (or, a whole heck of a lot of things… see what I did there?). Things are big as, hot as, loud as, messed up as, weird as, and sorry as hell. But on what do they base their adjectives? How much do they really know about Hell in order to draw a similarity that makes any sense? I mean, if I was to say, “That ant is as tiny as Mt. Everest,” would that even compute? No, because Mt. Everest isn’t tiny. Then why say something is as cold as hell? I mean, we know from the Bible that Hell is hot, but how hot exactly is up for debate; therefor describing something as “hot as hell” is within the realm of possibility, at least. Does that make you shiver thinking about it? It does me. Maybe Hell is “cold” after all. 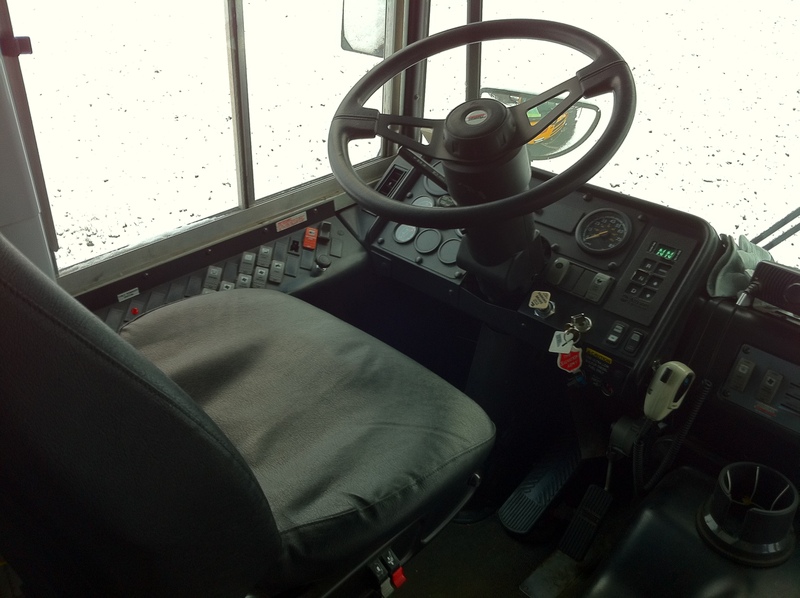 A while back I did a series of posts entitled Life Lessons from the School Bus. Below is the first one I did in the series (Feb. 2011). I hope the moral of the post is an encouragement to someone. Frankly, I would love to see some more snow. What one person calls terrible weather capable of ending life as we know it, may be just another work day to another. This truth is never more obvious than to bus drivers. Recently, we have had more snow in Tennessee than at any time I can personally remember. 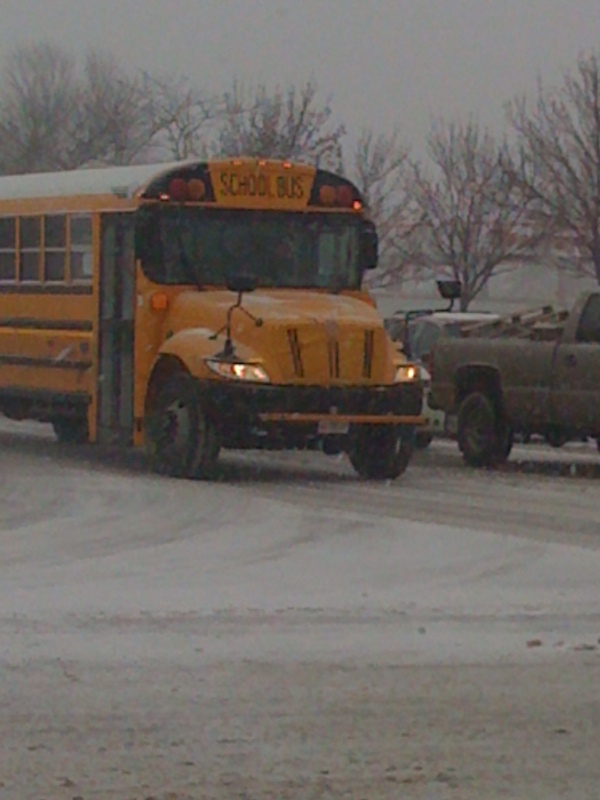 We have even used up all of our available “snow days.” Yet, while we were closing schools for snow down here, schools up north were quite literally trucking along. Looking out the windshield of my bus onto the lawn, you can see an inch or so of white stuff. Due to the lack of equipment and funds to regularly take care of the frozen precipitation (it’s not the norm down here, you know), just an inch, if it sticks to the roads, will shut down schools in a heartbeat. The mountainous and rural back roads off the main highways, where most kids live, usually are not salted or plowed. Typically, people around here just wait a day or so for the arctic terror to melt. Until then, driving is dangerous, so buses stay parked and empty. On the other hand, my wife was in Chicago during the last blizzard. She sent me this picture of a school bus transporting children in weather that would have given a Tennessee school administrator heart failure. What was the difference? They are used to it up there, and far more prepared. To people in Chicago, our worst weather is just another work day. But I wonder how they would deal with our heat, humidity, and lung-clogging pollen come August? Problems will come in life that may seem small to some, but huge to others. The key is to never view another person’s problem as insignificant. What you may think is no big deal could be earth-shattering to someone else. Learn to show grace and mercy to those who aren’t handling things as well as you. You may be the strength and encouragement they need to get through a tough time. Who knows, a time may come when an unexpected storm will snow you in. Maybe, just maybe, if you were living it up somewhere in Al Gore’s Tropicana, you did not notice the snow in Tennessee. Just this week we had more snow than any time since 1993. As a matter of fact, I slid down a hill on an inflatable sled for the first time ever. Not only did we get snow for Christmas, but no sooner than schools go back after Christmas break this snow comes and cancels classes for another week. Terribly unusual, I must say; but fun, I DO declare! Time to get out in the snow! After a day in the house watching all the four-wheel-drive trucks go by, however, I decided it was time to be a man. There was no reason for me to stay indoors while so many others were risking their lives and asking for an insurance claim, so to “The Ride” I went. I figured that there was no reason to fear the snow when I had an automobile with front-wheel-drive and an American V8 sitting under the hood. It was time for my family and I to go to Wal-Mart – even if we didn’t need anything – just to prove we could. "Global Warming - Cadillac Style"
Isa 1:18 KJV – Come now, and let us reason together, saith the LORD: though your sins be as scarlet, they shall be as white as snow; though they be red like crimson, they shall be as wool. Now, sin is not described as black in this verse, but as “scarlet.” There is a really good reason for that, but in this case I just thought of how white my black car had become. 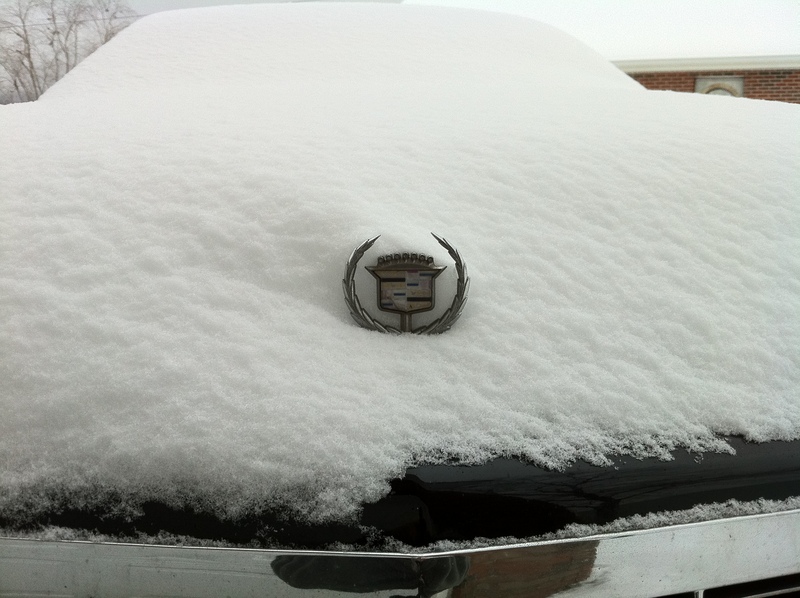 If my car had been scarlet, crimson, or whatever, it was now as white as it could be…white as snow….at least on top. Isn’t it wonderful how God can use such a simple little thing like cleaning the snow off your car to remind you of a profound truth? The great thing about God’s forgiveness, the forgiveness made possible by Jesus’ death and resurrection, is that it doesn’t just cover our sin with a layer of goodness – it cleanses us “from all unrighteousness” (1 John 1:9). That snow was beautiful, but underneath there was still a black car. Covering my car with snow made it white, just like doing good deeds can make us look pure and holy. Problem is, good works don’t change the color of the paint. Real change takes place below the surface. The difference between the forgiveness of God and snow is that salvation changes the color underneath. “Though your sins be as scarlet, they shall BE WHITE AS SNOW.” That’s a statement describing fundamental change, not a layer of frozen condensation. If you have never been forgiven of your sin, then at best you are just covered in a 7-inches of white that will one day melt. Why not let Jesus take your crimson-stained heart and make it new; make it “white as snow?” That’s real change – Jesus Style.